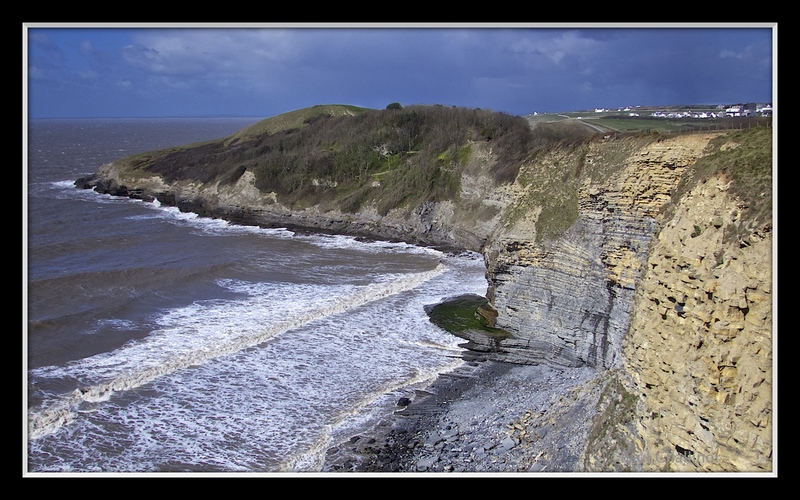 Today was a gentle walk along the coast at Dunraven Bay. Didn’t feel like going on a long march after a marathon journey back from Kuala Lumpur yesterday. I should have landed back in the UK in the morning, but the flight was delayed by 14 hours, and so I didn’t get back home until last night. But the day was too good to miss. Although it was blustery, the sun was shining, though with the occasional hail storm. In fact a perfect day to blow off the cobwebs down by the sea. So with Aunty trussed up with as much cold weather gear as it is possible to wear at the same time we set off along the path. Dunraven Bay has a long history, with an iron age fort on the promontory, where the walls are just about discernible with a little bit of imagination. 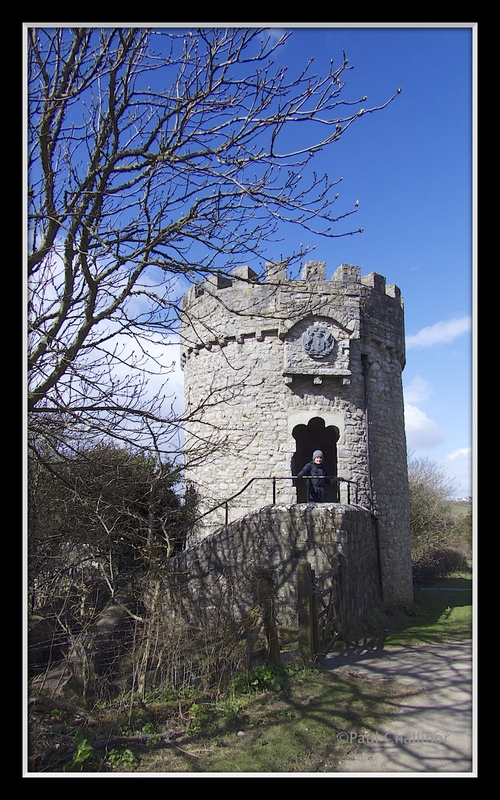 Since then there has been a series of fortifications, including a small Norman castle ending in a manor house which was used as a Red Cross Hospital in the Second World War. The only evidence of the house now are the gate house and the walled gardens. 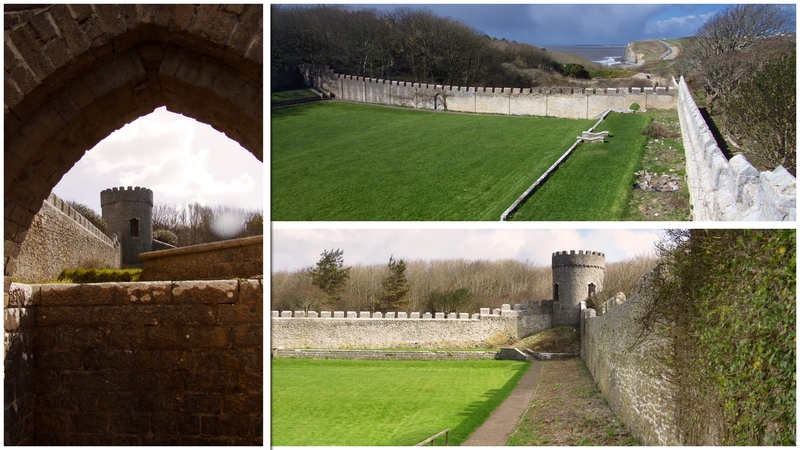 Walled gardens – the only real evidence there was once a grand house here. One of the sights that always fascinates me when walking near the coast is the way that the prevailing wind shapes and sculpts trees as they grow along the cliff edge. 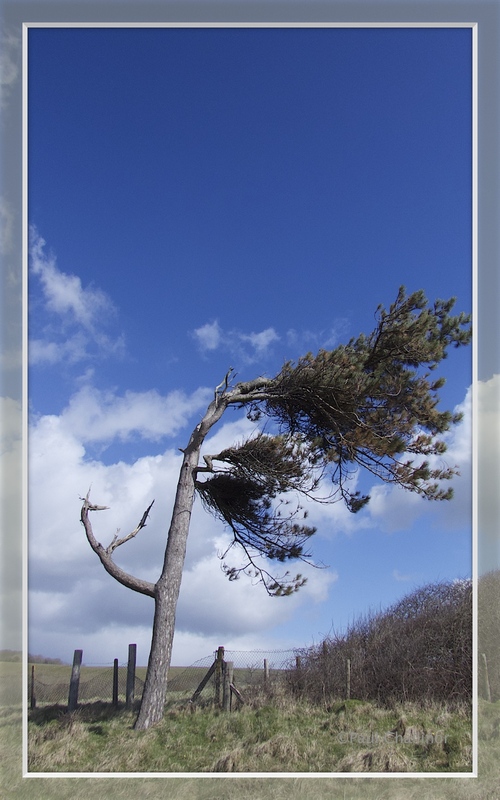 This pine has obviously seen better days, but is still hanging on determined to deny the wind it’s eventual victory. The old ice house gave us a great chance to play Rapunzel. Though today it was too cold for Rapunzel to take her hat off and let down her hair, so I climbed the steps instead. Rapunzel in full winter weather gear. From there we walked along the cliffs for a little way, but not too far as our stomachs were beginning to grumble. But not as loud as the grumble that came for Aunty when I admitted I hadn’t brought the stove to make coffee! The views from the cliffs were as spectacular as they always are. The waves were crashing into the base of Trwyn Y Wrach, a small promontory said to look like a witche’s nose. The iron age fort is perched on top of this outcrop. The coast along here is littered with small forts. 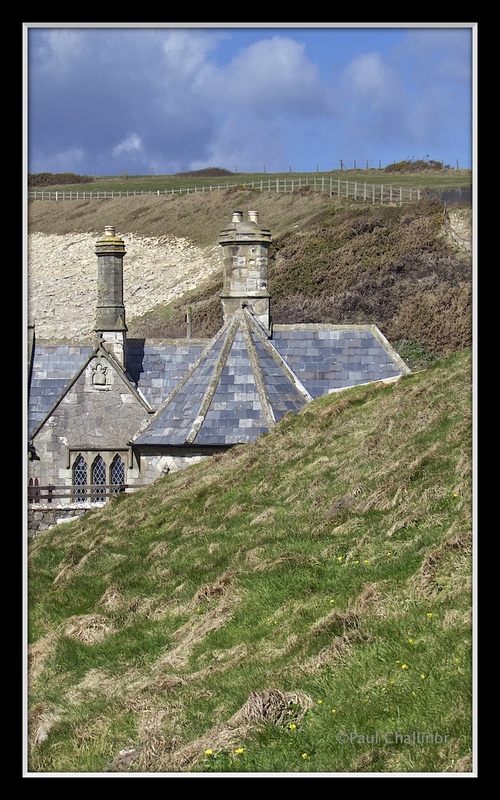 A little further east there is another on perched on the edge of the cliffs. You can’t see it in the photo below which looks towards Traeth Mawr (Large Beach), in fact with the tide in you can’t see the beach either. 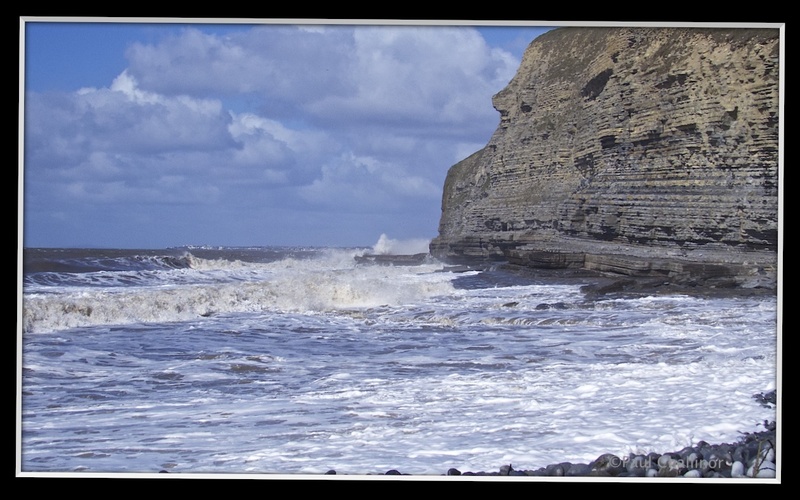 Dunraven Bay has been used a number of times in recent Doctor Who episodes, including the film Ironclad. When the tide is out there are some fantastic rock formations, including large ammonite fossils still embedded in the limestone. Next time we’ll time our visit for low tide. But at high tide there is nothing to see. By now we were getting hungry and we could hear a bacon baguette and coffee calling to us all the way from Barry Island. So back to the car it was and after a short drive we were stuffing ourselves with a fresh bacon buttie! 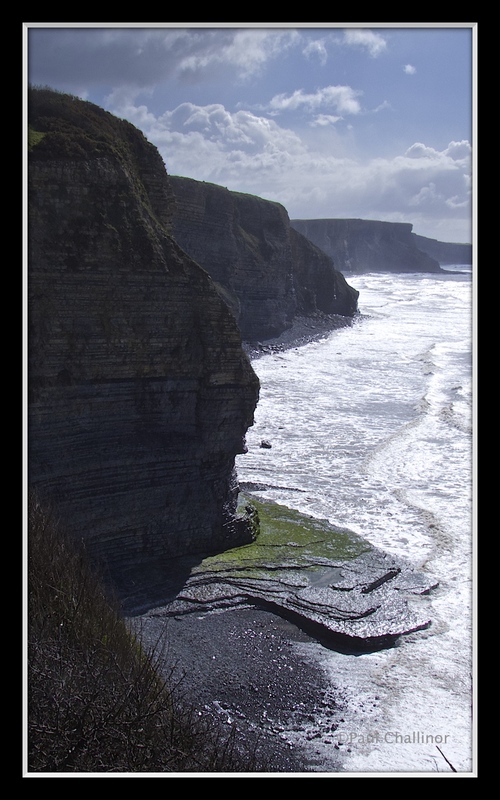 The cliffs all along this part of the South Wales coast must be a geologists dream. The layers of sedimentary rock are so clearly defined. 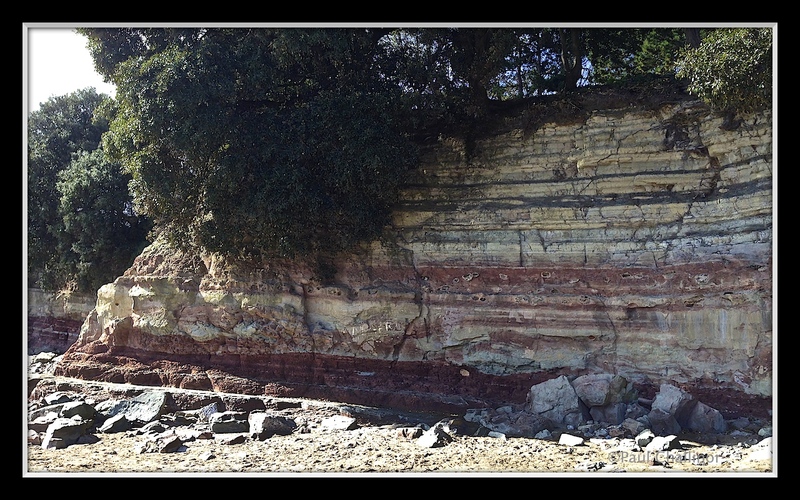 The different coloured layers of sand stone and mud stones stand out. Though Aunty directed me past skilfully ensuring I wasn’t able to start picking about in the layers. Sedimetary cliffs at the edge of Barry Island beach. By the time we got back to the car the tide had retreated from the old harbour. 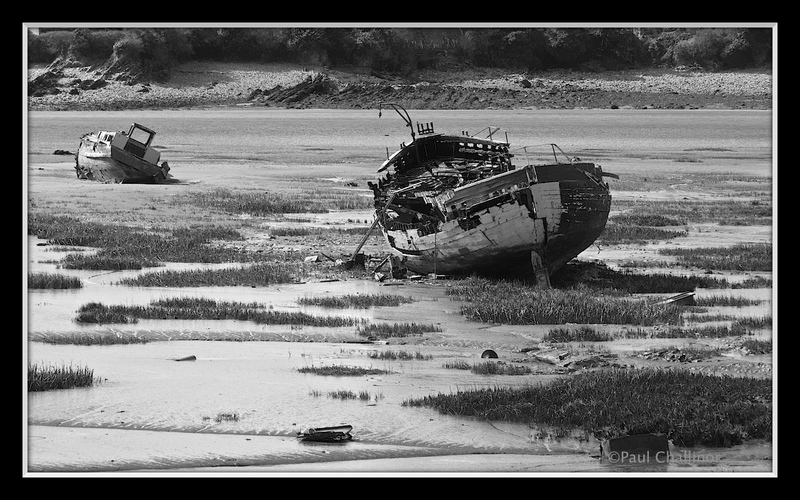 Though today it looks more like an old boats grave yard.